Former artistic director Paul Kerryson returns to helm the latest Christmas extravaganza in style. EX-EastEnder Charlie Brooks leaves Walford a distant memory as her powerful Blanche Dubois blazes a Southern storm. BILLED as a musical tale of one couple’s journey to start a family, Madeline and Joe is an emotional rollercoaster of a two-hander that makes heavy demands on its performers but pays charming dividends when they deliver. Written by Alex Bliss, with interesting, jazzy songs from Jed Spittle and Martin Slipp, it does exactly what it says on the tin. We follow the relationship from its unpromising opening in a nightclub toilet through the ups and downs of marriage, trying for a baby and ultimately facing life with just each other to stare at. The vicissitudes of IVF, the NHS and peer pressure all come under scrutiny in the parade of quickfire vignettes, played out in rapid succession for a fleeting hour, and there might be something to be said for spending a little more time exploring rather fewer scenes in more detail. But the songs are constantly entertaining, with engaging lyrics and some Sondheim-esque melodies to challenge the vocal talents of Sophie Tilley and Dominic Gee-Burch as the hapless couple. They’re asked to hit difficult melodic intervals and span enormous ranges, and both step up to the plate with confidence and a warmth that helps keep their characters likeable and believable. Slipp on piano and guitarist Andy Jenkinson supply a delightful musical backdrop to the numbers, while director Michele Gutteridge handles the performers with a sure hand and considerable wit – such as when percussion instruments are drafted in for prop service as obscure pieces of gynaecological equipment and the like. With its sights set on the Edinburgh Fringe, this is a show that looks the part and tugs appealingly at the heartstrings of an audience that responded by giving it a thoroughly appreciative reception. MUCH has been made of the Globe’s current ambitious project taking a production of Hamlet to every nation on the face of the planet. Less airtime has been given to the same theatre’s no less praiseworthy version of Much Ado About Nothing as it tours the UK before heading off across the Atlantic for performances in North and South America. This is a shame, as it’s a production that thoroughly merits being shouted about. Performed by a cast of just eight – who frequently make it feel like three times that number – this Much Ado is as vibrant and exuberant as any I can remember since Kenneth Branagh’s irrepressible film in 1993. Directed by Max Webster, it’s a revival of the show that toured last summer, but it’s as fresh and lively as if it had come straight out of the Globe this week. James Cotterill’s mini-me Globe set provides just enough of a structure on which to hang the constant ins and outs of Webster’s staging, while also giving the sense of being charmingly thrown-together. John Barber’s engaging and unintrusive music adds more in the charm department, played by the cast on a range of instruments from ukulele to trombone. But any Much Ado will depend on its Beatrice and Benedick for ultimate success, and here the production is brilliantly served by Emma Pallant and Christopher Harper respectively. Pallant takes a little getting used to, skipping quickly across her lines, but soon emerges as a fiery, forthright Beatrice, able to flip with dexterity from acerbic one-liners to emotional depth. Harper, meanwhile, cuts a wonderful dash as a boyish, boisterous hero, quick with the repartee but, once the narrative darkens, equally adept at the serious, sombre side of Benedick’s character. The pair are terrific together and provide a delightfully steady anchor at the heart of what could be a flimsy, flyaway production, packed as it is with colourful grotesques and plenty of physical flummery. But there’s a real sense of balance between the broad comedy typified by Alex Mugnaioni’s hilarious Dogberry and the pathos of themes such as male-female inequality. Webster’s production treads the line to perfection, and delivers a hefty dose of sheer fun into the bargain. Goodness knows what they’ll make of it in Rio de Janeiro. 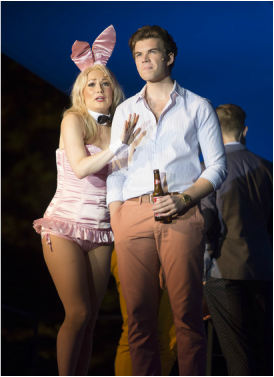 Funny bunny girl: Elle (Jennifer Harding) with Warner (Luke Newton) in Legally Blonde. YET another summer hit from the Kilworth stable unfolded this week amid typically dismal British weather, but nobody cared. The audience have as much fun as the performers, whose sheer exuberance spills over relentlessly from the open-air stage, and no amount of autumnal rain can dampen the spirits. Director Mitch Sebastian has again pulled off the neat trick of matching a well-chosen show with an impressive cast and West End production values, making Legally Blonde an infectious, highly enjoyable romp. It plays out on an ingenious and versatile set design by Philip Witcomb, which opens out in a variety of ways to offer college dorms, a hair salon and even a courtroom according to requirements. Jennifer Harding is a feisty Elle, the apparently air-headed blonde who follows her wealthy boyfriend to Harvard Law School in an attempt to save their relationship, only to find her own talents taking her in a whole new direction. Luke Newton as the spoilt brat boyfriend is nicely judged, while Greg Miller Burns plays the boyish would-be suitor Emmett to perfection. There are nice cameos too from Graham Vick as Elle’s snobbish professor and Jodie Jacobs as the down-to-earth hairdresser who acts as her confidante, while the ensemble work is consistently excellent across the company. The pit band is perhaps not as tight and well-balanced as Kilworth audiences have come to expect, but the pace never falters and there’s a joyous spirit to the score and lyrics that encapsulates the froth and fun of the original movie while still packing some moral messages. Whatever the weather beyond the theatre boundaries, the sun is definitely shining on the stage. I DON’T suppose theatre owner and producer Celia Mackay imagined for one moment that the title of this year’s first show in the annual Kilworth summer season would be taken so literally. From an hour before the curtain until well after the bedraggled audience had gone home, the heavens streamed down a constant downpour. Maybe the indomitable British spirit in the face of adversity helped, but there was to be no dampening of the audience’s spirits by a bit of sheeting rain. The sheer exuberance of this feelgood show and the obvious fun being had by everyone on stage is infectious and utterly winning. Resident director and choreographer Mitch Sebastian performs magic with his extraordinary dance routines and spectacular staging, with considerable assistance from Philip Witcomb’s glamorous 1920s design – although a set of steep stairs and a terrifying sweep of a slope leave your heart constantly in your mouth for the performers’ safety. In the pit, no expense has been spared on a fabulously tight 11-piece band under the musical direction of John Morton. The quality of playing and the deft mixing make Kilworth’s sound design among the best on the circuit, and contribute enormously to the enjoyability of the production. Among the cast, Sebastian has gone for recognisable types in the roles made so famous on screen by Gene Kelly, Debbie Reynolds and Donald O’Connor – with great effect. Graham MacDuff has plenty of charm as Don Lockwood, the silent movie star attempting to make the transition into the talkies, and his singing and dancing are top-notch. He’s matched every step by Carolyn Maitland as Kathy Selden, the would-be actress whose feisty refusal to fall for his Hollywood schmaltz makes her doubly attractive to him. Her voice is as assured and warm as her personality and they make a terrific double act. But of course, this is actually a triple act, and Adam Margilewski does a fine job in the tricky role of Don’s sidekick Cosmo. It’s his line about the weather that wins spontaneous applause. Jenny Gayner almost steals the show as the ditzy blonde leading lady whose squeaky voice means her career looks doomed, and she mines every last comic nugget from this peach of a role. And, as always at Kilworth, there’s strength across the company, with a versatile and committed ensemble filling the stage with action and movement from start to finish. There are some cumbersome scene changes and perhaps too much business going on, with a first half running to more than 90 minutes (even accounting for an unscheduled technical hitch), but the energy of the show and the stunning routines keep the toes tapping well into the wet night. THE whirring that’s faintly audible if you listen carefully throughout this show could be the sound of JM Barrie turning in his grave. Alternatively, he might just be chuckling away to himself with glee. The fact is, the latest offering from the disappointingly fictitious Cornley Polytechnic Drama Society is a bundle of fun from start to finish. This is the hapless troupe of misfits who brought us The Play That Goes Wrong, and their elegantly mistimed seasonal production also does exactly what it says on the tin. Whether it’s malfunctioning sets, warring cast members or vindictive props, everything is perfectly arranged to fail magnificently. The only thing that remains anywhere near intact by the end of this madcap show is Barrie’s timeless story. Peter Pan is still, somehow, there at the heart of the silliness, and it’s greatly to the company’s credit that their irreverence about all things theatrical does not make a casualty out of the narrative. In fact, it’s one of the factors that keeps the laughs coming: we all know what’s meant to happen, so it’s all the more entertaining when it doesn’t. Laurence Pears plays the nominal man in charge, Chris Bean, doubling as director of the fiasco and its Captain Hook. His po-faced determination in the face of disaster is meticulously performed and toe-curlingly delicious to watch, while Cornelius Booth as his competitive sidekick is delightfully hopeless. It’s a large company – eleven performers and at least three hardworking stage crew members – and it runs like a well-oiled machine, as it must for the precision choreography and physical gags to work. It may not have either the element of surprise or the relentless slapstick quality of its predecessor, but it’s an evening of big laughs, impeccable performances and winning charm. I venture to suggest that Barrie himself would have approved. WHEN director Bob Carlton first put together this spoof sci-fi comedy musical packed with Shakespearean dialogue and rock and roll songs, he can hardly have expected it to be a cult touring hit 25 years later. But so it has proved, and the faith he put in his source material continues to pay off. Return to the Forbidden Planet is part homage to 1950s B-movies, part game of spot the Shakespeare quote and completely silly. Its cast deliver caricature villains, chiselled spaceship captains and glamorous lab assistants with appropriate relish, while simultaneously performing the relentless score of old reliables on a host of ever-changing instruments, live on stage. It’s hard to imagine the impact this must have had in 1990, in the days before actor-musicians were so commonplace as to have become cliched. Now, with every other touring show employing the technique (usually as a cost-saving exercise), it looks a little dated and creaky ­­– as does the show itself, if truth be told. That’s not to impugn the energy or commitment of the performers, who prove both versatile and dedicated to their task of retelling The Tempest in this thoroughly daft but ultimately highly likeable way. Jonathan Markwood makes a fine, fruity-voiced Dr Prospero, the possibly mad scientist marooned on a faraway planet, while the musicianship of Steve Simmonds as the talented Bosun and Greg Last as the ship’s navigation officer and show’s musical director stand out among the band. There’s even a delightful video cameo from Brian May, Queen guitarist and astrophysicist, to lend a note of scientific and musical gravitas to the proceedings. By the end of the night, the audience are on their feet for a stomping curtain call, and the return of the Return can safely be called a mission accomplished. THE growing problem of dementia and its impact on both sufferers and their carers is unquestionably one that is worthy of public debate. So full credit to the University of Nottingham and their partners Meeting Ground Theatre Company for their far-sightedness in tackling the issue head-on in this dedicated and passionate piece of theatre. Inside Out of Mind is the result of a whopping research study into dementia ward staff, distilled by Meeting Ground’s Tanya Myers into a two-hour production that began life aimed primarily at healthcare workers but has subsequently taken off as a powerful appeal to the wider public. There’s an impressionistic approach to the delivery of sometimes difficult and painful material, with the large cast offering snapshots into the lives of those resident and working on an unnamed ward. For me, the almost random assembly of quotations, thoughts and opinions robs the piece of some of its overall impact: I would have preferred some kind of clear narrative, a through-line allowing characters to grow or develop or change. As it is, we get a good impression of how things stand without much idea of what to do about it – or even why it’s becoming increasingly critical. But maybe that’s just me. What is beyond doubt is the talent and ambition of the nine-strong cast, many of them doubling a multitude of roles from patients to nurses to relatives with confidence and considerable skill. Robin Bowerman plays a Frenchman with hazy recollections of the war in a poignant, moving portrayal, while Robin Simpson offers a trio of contrasting characters, each carefully drawn and delivered in accomplished fashion. The show is almost stolen by Maxine Finch, whose two wonderful creations are both believable and hugely entertaining. Nurse Grace is a God-fearing West Indian with a heart that is less hidden than she’d like, while patient Elsie is a mini comic masterpiece, licking other residents’ biscuits and flailing her handbag around with abandon, yet retaining an emotional core that really tugs on the heartstrings. If the message is a little blunt and obvious – dementia’s bad, we need to do something about it – there’s no denying the importance of hearing it at a time when numbers of sufferers are growing with no sign of let-up, while the resources to handle the crisis appear to be dwindling. Joel Fossard-Jones and Kirsty Hoiles as Adrian and his mum Pauline. Picture by Pamela Raith. ANYONE who remembers the 1980s will recall just what a phenomenon Adrian Mole was. Why it has taken this long to bring him to the stage in musical form is something of a mystery, as the idea is one of those that seems so blindingly obvious now that it’s happened. And where better to premiere this new original show than Adrian’s home town of Leicester? Local writer Sue Townsend first introduced her 13-and-three-quarter-year-old hero to the world in 1982 and he stayed with her, on and off, for the rest of her life, culminating in The Prostrate Years in 2009, five years before her death. He was always naïve, lovable and a bit geeky, and he emerges fully formed in this new incarnation from writers Jake Brunger and Pippa Cleary. Brunger’s words are amusing and true to the spirit of Townsend’s books, while Cleary’s songs are jaunty and bright, if never quite reaching the summit of real memorability. Director Luke Sheppard works with their script and score to bring out the best moments, including a patriotic Royal Wedding number and a school Nativity that borders on the sacrilegious. But the real delight of this production, which is constantly fresh and has a twinkle in its eye, is the performances. While the adults do a fine job doubling parts from schoolchildren to old wrinklies, it’s the four central roles of Adrian and his entourage that are most remarkable. In this performance, Joel Fossard-Jones gives an extraordinarily assured rendition of our protagonist, ranging from lovelorn poet to would-be rebel with ease and bucketloads of charm. To carry an entire show – let alone a new musical – is a huge burden to put on the shoulders of any 13-year-old, but Fossard-Jones rises to the challenge comfortably, earning a well-deserved ovation. His young colleagues Kwame Kandekore, Edward Cross and Lulu-Mae Pears as best friend, bully and object of affection respectively also acquit themselves magnificently, helping the show along with verve and dedication. 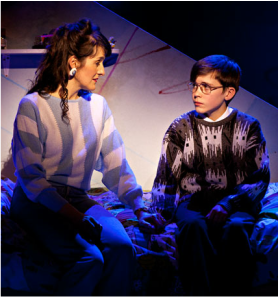 Adrian Mole, poet, diarist and now musical leading man, has come of age.